In this chapter, we detail the main LTC legislations in Austria, Belgium, the Czech Republic, England, France, Germany, Italy and Spain. Each country profile includes up-to-date legislative information, details on the assessment of need procedures, the eligibility rules and the in-kind or in-cash benefits for the eligible population. 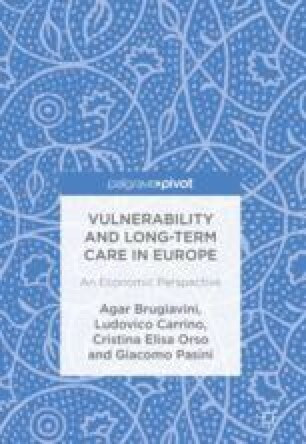 The chapters for Belgium and Italy are organised at the regional level, given the high degree of heterogeneity of the local LTC programmes. BMASK. (2013a). Ein : Blick 5. Pflege. Orientierungshilfe Zum Thema Behinderungen. (978-3-85010-315-2). Wien: Bundesministerium für Arbeit, Soziales und Konsumentenschutz. Retrieved from http://www.sozialministerium.at/site/Soziales/Menschen_mit_Behinderungen/EINBLICK. BMASK. (2013b). Informationen zum Pflegegeld. (978-3-85010-315-2). Wien: Bundesministerium für Arbeit, Soziales und Konsumentenschutz. Retrieved from http://www.sozialministerium.at/site/Soziales/Pflege_und_Betreuung/Pflegegeld/. European Commission. (2013a). Your social security rights in Czech Republic. European Commission. Retrieved from http://ec.europa.eu/social/main.jsp?catId=858. European Commission. (2013b). Your social security rights in France. European Commission. Retrieved from http://ec.europa.eu/social/main.jsp?catId=858. MISSOC. (2014). Comparative tables on social protectionṣ—XII. Long term care. European Commission, Department of Employment, Social Affairs and Inclusion: Mutual Information System on Social protection. Retrieved from http://ec.europa.eu/social/main.jsp?catId=815&langId=en. MPSV. (2005). Preliminary National Report on health care and long-term care in the Czech Republic. Ministry of Labour and Social Affairs of the Czech Republic. Retrieved from http://www.mpsv.cz/files/clanky/1343/report_health_care.pdf. MPSV. (2009). Social services and care allowance in the Czech Republic. Paper presented at the Social Services—A Tool for Mobilizing Workforce and Strenthening Social Cohesion, Prague. Retrieved from http://www.mpsv.cz/files/clanky/7033/leaflet_on_social_services.pdf. OECD. (2011). Health at a glance: OECD indicators. Retrieved from Paris: http://dx.doi.org/10.1787/health_glance-2011-en. Pensionsversicherungsanstalt. (2009). Gutachterfibel-Bundespflegegeld. Wien: .Pensionsversicherungsanstalt. Retrieved from http://www.pensionsversicherung.at/. SCIE. (2015). Eligibility determination for the Care Act 2014. Retrieved from London: https://www.scie.org.uk/care-act-2014/assessment-and-eligibility/eligibility/. Sermeus, W., Pirson, M., Paquay, L., Pacolet, J., Falez, F., Stordeur, S., & Leys, M. (2010). Le financement des soins infirmiers à domicile en Belgique. Retrieved from Bruxelles: https://kce.fgov.be/fr/le-financement-des-soins-infirmiers-%C3%A0-domicile-en-belgique. Untermarzoner, J. (2016). L’assegno di cura in Alto Adige: Stato attuale. Sviluppo. Prospettive. Retrieved from Bolzano: www.afi-ipl.org. WHO. (2002). Towards a common language for functioning, disability and health. Geneva: World Health Organization Retrieved from http://www.who.int/classifications/icf/en/.